Do you really want a Porsche barn find? I tend to take reports of ‘barn finds’ with a pinch of salt, especially after hearing about a magazine faking a photoshoot of an abandoned Porsche, adding hay bales and detritus to the images to give the impression that the hapless car really had been uncovered in a farmer’s barn. It hadn’t. Let’s face it, most people are going to store cars in garages rather than barns, for the simple reason that’s what most of us have outside our homes – garages, not barns. A sweet story and, because we could see it had potential, we ended up with the car. It was in a sorry state, with the brakes all seized and the keys missing, but was basically sound. We put it through a full and thorough restoration, including rebuilding the engine and gearbox, and respraying the body in Old English White, rather than the original black. The result was beautiful and it attracted a lot of attention in the showroom (that’s it, above). Another eye-catcher was a wonderful 924 Turbo which we also restored (below). That was one of three such cars that we found on eBay and ended up picking up as projects. That first one turned out to be such a massive job to do properly, though, that we didn’t get around to doing the other two, but decided to sell them on as projects for someone else. And that is the problem with so-called barn finds. They invariably need a lot of work to bring them up to a saleable standard so, as such, aren’t economically viable from a business point of view. That would probably have been the case with a 911SC I went to see last year. It had been stored in an old wooden garage (squint and it could have been a barn) for eight years and was looking rather sorry for itself. The problem, as you can imagine, was rust. The B posts were gone, all four wings were bubbling and the sills were looking a bit suspect. I know from experience that, once you start digging around a rusty 911, there will invariably be much more corrosion than is first apparent. Which means more expense. On top of that, there was an oil leak from the engine and, after eight years, the brakes will undoubtedly need attention. In short, on top of a bodywork restoration, the mechanicals would need fully recommissioning and, again, that always costs more than you expect. To be fair, the Porsche had had an engine rebuild, so it would make an excellent project for someone wanting to restore a 911 for their own pleasure (if that’s the right word), and they’d probably end up breaking even on the finances. However, as a business proposition, it would simply take up too much time and money. That wasn’t the case (or at least I hope it won’t be) with another Porsche I found in a barn last month (ok, a wooden garage again). Snuggled up against a couple of lovely old vintage motors was a 924S Le Mans. This is a rare limited edition Porsche and one which I reckon is a good long-term investment, as there is strong interest in 924s these days. This one had also been sitting around and we couldn’t get it started. Apart from a bit of tidying to the bodywork and interior, though, it seemed sound and with refreshingly few miles on the clock. So a deal was quickly done and we had it trailered away, ready for recommissioning and bringing up to showroom standard. 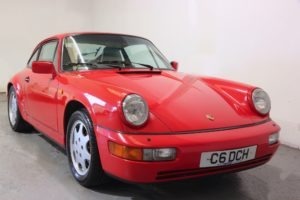 So maybe ‘garage finds’ is a better description for Porsches that have been squirrelled away for years. They do exist if you look hard enough but don’t expect them to be be a cheap way into Porsche ownership – I can assure you, that won’t be the case. Good points here. Has made me think twice. Steve McQueen’s Le Mans 911S – what would you pay for it?